Need the Ultimate Barbie Child Party Idea to help get that party off the ground? Well stop looking around the web, because you will find everything you need right here!!! So pick something that is convenient for you. I have listed a few ideas to help you get started. * Home: I feel this location is suitable no matter what theme you are having, unless it is an Away-from-home Theme. I would hope a Barbie party wouldnt get as rowdy as, lets say, a Backwards Party. I am sure no matter how you plan this party, whether in the house or outside, will be one of your greatest parties ever! * Gym: Like I said earlier, no matter where you have the party, its going to be great. Why not opt for a larger location which gives you more room for the food, games, etc. Call your local school or church and see if they rent out their gym. I figure, if you have the money in your budget to rent a party location, having the party away from your home will be less stressful on you! * Prince/Princess: Start by reviewing our ultimate collection of Barbie pictures and clip art. Pick out one of the pictures and save it to your desktop. Use a simple word processing program to make the invitation. Put the picture you saved on the front of the invitation and in the background on the inside. Buy colored invitation envelopes and mail each one out from Princess “child’s name” to the appropriate Prince or Princess. Before the princess and all her friends arrive to the party location, we need to think…What would a castle look like inside? Where would the decorations go? What colors should they be? Think about how you want to setup the party before reading the decoration ideas. That way you won’t be limited to my list, it will simply add to yours. Be creative, there are no boundaries to decorations. Before we get started in decorating the castle, take a look at our ultimate selection of Barbie coloring pages to help you decorate. You can have you kids color them and put them around the house or just hang them up as-is, it’s all up to you. Just don’t forget to check it out! How are the guests going to know where the party is? Of course you added the address, but that might not be enough. Place some solid color balloons on your mailbox to identify the party location. But that’s not enough. Make sure there are enough balloons to decorate the whole party area. For some reason kids are mesmerized by balloons and I don’t know why. Try and have enough for each child to take home, it will make a great party favor. Looking for the Ultimate Party Decoration that kids will be talking about for months after they leave? Check out this Princess Castle. Your child and guests will love to play and make believe all day in this perfect decoration. You don’t have the money allotted in your budget for the princess castle, but still want it. Are you creative? Good…here is an excellent idea to turn a box into a castle. Get a huge empty cardboard box and cover it with paper and draw rectangles with a marker to make it look like stone. Sponge paint some stars and flowers on it also. Be creative and turn that box into a wonderful castle. No party is complete without having some confetti around the party area. You can place it on the tables, chairs, counters or wherever your heart desires. This castle confetti fits in perfect with your theme. Or maybe you want some Happy Birthday confetti. Either one, they are a great addition to the decoration area. Need something to decorate that plain ceiling? How about some streamers? Here is a great selection of crepe, gossamer and many more types of streamers. Don’t hold back, you can’t ever have too many streamers around the party area! To create colorful two tone streamers, put two differently colored streamers back-to-back, twist as you walk them to the wall, and attach at shoulder height. Tie bows with Sparkle Netting across the top of each chair back. The bows can be cut to any length and even look lovely with tails trailing on the floor. Make bows to hang anywhere and everywhere…chairs, doorways, gift packages or table-ends. The bows hold their shape beautifully at a fraction of the cost of wired ribbon. These are just a few ideas to help you get started for your Ultimate Barbie Child Party Idea. Take the ideas you like and transform them into the ultimate party. Good luck and have fun. There are so many colors you could choose for this party, but here are a couple of the most popular. The most common is pink and purple, followed by white and pink and finally pre-bought tableware. Short on time, need some pre-bought tableware? Here is a great selection of Barbie plates, cups, napkins, forks, knives, etc all with the Barbie Theme. Want to purchase some solid colors and add your own personal touch? Here is the ultimate selection of silverware, plates, napkins, etc in solid colors. Now you have got some of the decorating out of the way, you need to decide on what your princess is going to wear. I have found some great stuff on the internet to turn your daughter from normal to royalty…To get started, look at these ultimate accessories. They include wands, shoes, tiara, etc. All great quality and a perfect accessory to whatever costume you choose. Here is the ultimate costume accessories any child could want for her Barbie party. A customized tiara, which would look beautiful on your child. It includes up to 9 letters and is worth checking out. The princess must show up at her party in her best gown. Here is a picture of what your Barbie could wear to the party. Don’t like that one, here is a great selection of many Ultimate Barbie Costumes available. Check them out! Bubbles and Body Jewels are always a big hit, and both are perfect Ice Breaker Activities. Let those who arrive early get be-jeweled and play with bubbles while they wait for all the guests to arrive. Gather up all the fun dress-up clothing you can find around your house (or borrow from your friends)…fun, frilly, foo-foo dresses, Feather Boas, high heeled shoes, etc. Let the children start dressing up and prepare themselves for the festivities that are about to begin. There are several craft kits available for your guests to do while they are waiting for everyone to arrive. Have each child decorate a Fairy Tale Princess hat. Buy pink poster board and roll it into a coned shapte. Decorate them by gluing heart, lips, and flower shaped confetti to the hat and then have each child choose pink or purple ribbon of tulle to hang down from the top of the hat. Give the children different Barbie coloring pages for them to color. After they have finished, hang them up around the party area. You can also give these coloring pages back to the children as they are leaving the party. * Finger sandwiches: Make your child’s favorite types of sandwiches and cut them into fun shapes with cookie cutters. Put a colorful food pick in each one that matches the colors of your theme. * Twinkle Stars: Make your famous sugar cookies and cut them into stars. You can either decorate them before the children arrive or have them do it at the party as an activity. * Pigs in a Blanket: Take a croissant and cut it in half. Place a hot dog in the middle with some strips of cheese. Bake in the oven until cheese has melted. The children will love these. * You can serve the drinks that children love, such as, Capri Suns, Koolaid Koolers, Koolaid Jammers, boxed juice, etc. * Make up your famous Pink Lemonade. This will fit perfect in your party colors and kids love it! * Make pink punch with raspberry sherbet ice cream, sprite and ginger ale. * Make each guest a fruit parfait using yogurt, granola and fresh fruit. Top it off with a whipped topping. * Serve dry snacks in Heart Shaped Buckets. Deciding on whether you are going to make or buy the Ultimate cake is a tough decision. It mainly depends on how much time you have and how many guests are coming. I would suggest for a smaller party, you try and make that Ultimate cake. But if there is going to be a large number of guests, maybe a large cake made by the baker might is the best decision. It’s up to you, but here is an idea on making a Barbie cake. 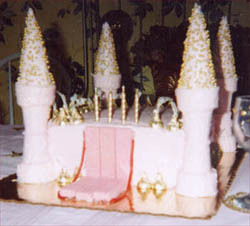 Check out this Ultimate Barbie Cake. Click on the cake to get the recipe! This will definitely be the highlight of the party. Click here for the Ultimate selection of Barbie’s. Need something besides a barbie toy? Click here for the Ultimate selection of toys. Looking for the Ultimate Barbie Games and Activities? I have dedicated a whole page for these games. I know you will find enough choices to fill the games section of your Ultimate Barbie Party. Before we get to those games, check out these Ultimate Piñatas. Your child will definitely love them!!! These pinatas don't quite fit your Barbie Theme? Click here for the Ultimate selection of birthday pinatas. Now it’s time for the games. Check them out here. Now the parties over, what do you do? Plan the next one? Sure, but you don’t want to forget about the guests that helped you celebrate your child’s birthday. Make sure to send them some type of thank you note. Whether it is store bought or hand made, just make to get it out no later than a week past the party. Also, if you took any pictures at the party, try to include one in each invitation. Here is a great thank you note to send out, it is the Ultimate Note to end the Ultimate Barbie Child Party Idea.